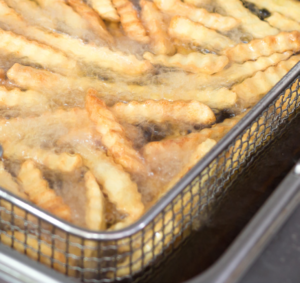 Restaurateurs maintain the quality of fried food items by focusing on fryer oil. As restaurant operators have learned — sometimes the hard way — that offering consistently delicious food is imperative to keeping guest counts high and customer complaints low. Food caliber is dependent on myriad factors, but few are more important than the quality of the oil that is used in fried foods. Taste, texture and color are the attributes most affected by excellent oil quality or lack thereof. “When it comes to cooking our food, the type of oil, the performance of our oil and managing the oil properly are all very important to us,” says Lisa Kartzman, director of purchasing for New York-based Shake Shack, the 50-plus-unit contemporary roadside burger stand. Sharon Nahm, executive chef at E&O Kitchen and Bar, a modern Asian restaurant and lounge in San Francisco’s Union Square, agrees pristine frying oil is the key to keeping fried foods a crispy golden brown each and every time. “I think it is easy to tell when you are eating food that has been fried in oil used multiple times. Either the color is darker or the flavor is off putting,” she says. The restaurant, which menus crispy chicken spring rolls, fried calamari and its signature Indonesian corn fritters, is a high-volume operation that turns out large quantities of these items. “We change out the oil daily and every shift we strain and skim the oil. We also make our corn fritters in their own fryer to ensure the flavor is consistent,” says Nahm. “Food fried in oil takes on the character of the oil. If that character is well kept and fresh, it will deliver well-kept and fresh food; if abused and old, you will get abused and old food,” says Bob Karisny, vice president for menu strategy and innovation at 388-unit, Cheyenne, Wyoming-based Taco John’s. Tina Swanson, vice president of customer experience for Restaurant Technologies and an expert in oil management, works closely with restaurants nationwide to combat oil mishaps in the kitchen. Swanson says operators should never manage oil on a calendar schedule — such as disposing of it every Monday — because the volume of how and what a kitchen is frying can fluctuate from day to day; thus, their oil disposals should follow suit. She is quick to point out that today’s savvy consumers can taste the difference. “If I go to a restaurant on Tuesday and have a fried dish that is delicious, but then go in the following Monday and it doesn’t taste as good, I know that operation is not managing its oil properly,” she says. Guest satisfaction is significantly higher — 74 to 81 percent higher — when measured between restaurant franchises where oil is managed properly and those that are not, Swanson notes. Swanson adds that it’s no accident that Restaurant Technologies’ largest customer is known to have the best fries in the world. “Clearly, if you are frying food, there are very few qualities other than the food product itself that have the impact of proper oil management,” she says. Karisny says some of the side effects of poor oil management which guests will take note of include foods that fail to crisp up as much; items with an oily or lightly rancid oil flavor, or a darker color; and how well a coating adheres to a food item. “Make sure everything is calibrated properly and that all burners are operating as designed through regular, preventive maintenance,” he says. Kevin Chojnowski, executive chef at Oleanders at McCarren Hotel & Pool in Brooklyn, New York, is fully aware of the downside of not keeping frying equipment clean. “It seems like a simple practice, but when I started off my restaurant career working in a greasy spoon as a busboy and dishwasher, I remember there would be days on end that the fryer would not get scrubbed or the oil refreshed,” he recalls. Michael Santoro, executive chef, Kingbird at The Watergate Hotel in Washington, D.C., says he is a firm believer that “the devil is in the details” and that applies to kitchen oil management. “Keep the oil fresh. Purchase a fryer with an automatic filtration system in it if possible, so it is constantly being cleaned during all service. McDonald’s uses this technology.” Invest in an automated oil management solution so that it’s easy and safe for the kitchen staff to manage the oil. This helps ensure that it actually happens.